If a man mistakenly marry an olosho, he has entered a mess; they hardly change. Unless God intervenes. 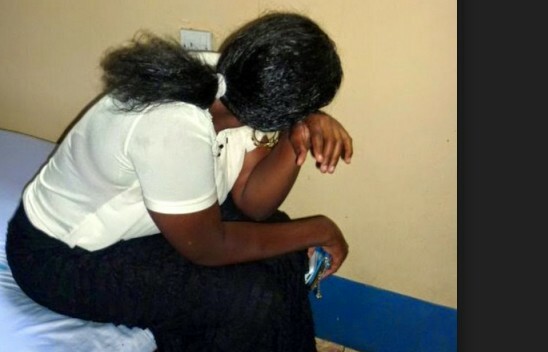 A mother of two, Nneka, who left her husband’s house along Baga road in Maiduguri, Borno State, for over three months has been traced to a brothel where she has been secretly working as a prostitute. The married woman was said to have dressed up one evening and left the house on the pretext of going to buy something in a provision store. Since then she had failed to return or make contact with her husband, until more than three months later when the husband caught her red-handed. A Civilian JTF man in Maiduguri, Kabiru Skido, who assisted in tracking the shameless wife, said he was on duty checking vehicles along Baga market road when the husband of the woman ran to him and requested that he should help stop a commercial Keke NAPEP that was approaching them. “I stopped the oncoming Keke NAPEP when suddenly the man ran to one of them and started dragging a woman out. My colleagues and I intervened to know what was happening. He explained that the woman was his wife and that he traced her to a brothel behind the market but rather than follow him home, she jumped into a Keke NAPEP and was about to escape once again. “Suddenly, the wife started shouting saying: 'yes, you are not taking good care of me. I have to go and find something to take care of myself.' When we realised that they were about to raise a crowd around us and at a time they started talking in their Igbo language, we invited an elderly Igbo businessman from the market, called Pa Okoro, who came and took them away,” he said. When contacted, Pa Okoro said she told him her husband had not been giving her pocket money and that he also refused to set up business for her. She said she's sleeping with men to raise money for business.